LDJ Events are based at the heart of Shropshire in the town of Telford. We are a small, family run entertainment company who offer entertainment packages tailored to meet your specific needs. We have the sole focus of creating incredible experiences that are memorable and fun, whilst making the planning process seamless and stress-free. We are proud to be Resident DJ at the UK’s Entertainment Venue of the Year (4 years running as voted for by The Best of Telford) Casey’s Cordingley Hall in Donnington and whilst working closely with their team, we provide our services all over Telford and the surrounding areas. We pride ourselves on offering a professional and reliable service to all of our clients however big or small the booking is and at competitive prices. We use the latest in audio visual equipment to provide the highest possible quality of service and have experienced staff on hand every step of the way from booking and planning your event, to running your event right through to when your event is complete. 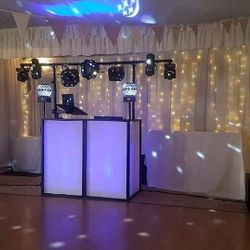 LDJ Events provide a Mobile Disco Service to all venues accross Shropshire and surrounding areas for a wide range of events. We have Packages that can be tailored to meet the specific requirements for your Big Day from a Basic Disco to a full entertainment package. We bring the Photographer, Props and Open Photo Studio, all you have to do is provide the smiles and strike a pose! Our Mini Disco is action packed with Party Games, Party Dances, Challenges, Top Hits and comes complete with our Mobile Disco Setup. LDJ Events are proud to offer a Giant Game Package for Hire. Perfect for keeping your guests entertained at your Wedding or Party!